When I first started dog training I thought the only way to reward a dog was with treats… I was so wrong! Dogs are rewarded in many different ways and each and every dog is motivated by something different. Not all dogs want to play tug, not all dogs will respond to treats, you have to find what motivates your dog to perform and when they perform, BAM! Here is your reward. I created a video the other day at the request of one of my clients who just couldn’t grasp the complete concept of playing tug with his dog as a reward. He understood the reward was the tug, but how to deliver the reward is just as important as the reward itself. What is a tug toy? 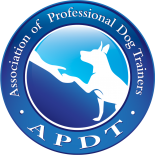 The tug toys that we use in our dog training programs are produced from Demanet in Spain. The toys themselves are about 7-12 inches in length, 2-3 inches in width. 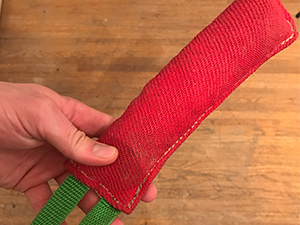 The material of the tug toys is bite suit fabric. Here’s an picture of the one I use with my dog Eros. TUG TOYS ARE NOT CHEW TOYS, THEY ONLY COME OUT WHEN TRAINING. DO NOT LEAVE YOUR DOG ALONE WITH THEM. First and foremost, to train your dog with a tug toy, they have to have good prey drive. The desire to chase and bite and shake things. The tug is a prey object to the dog. When the perform a behavior or command correctly, the dog then wins the prey reward and gets a little fight out of it as well. Secondly, playing tug, contrary to popular belief, does not allow your dog to establish dominance over you. At least not if it is done correctly. Playing tug with your dog should actually build your bond and increase their engagement levels with you. Watch this short video on dog training techniques about playing tug with your dog. I hope that this video has helped you understand more about playing tug with your dog. Dog training with a tug toy is a very positive way to train your dog, it will increase their engagement levels with you as a handler, and will get you both some exercise! If you have any questions about playing tug with your dog, or would like more information on our dog training programs please visit our contact page and drop us a message!